Coming off two wins over the Colorado Crush in five days, I spoke with Salt Lake Screaming Eagles head coach Matthew Sauk. The team is improving, but has had some mistakes, which he hopes to see corrected over the next several weeks. We discussed some strong performances by several players over the course of the season. He talked about the keys to turn losses into wins, injuries, being resourceful with filling in the holes left by those injuries, keys to turning losses into wins, identifying with players and coaches looking to move up to the next level, fatherhood, and looking at life outside of football. It was very enlightening and interesting. Despite the coach thanking me for "rambling," it was nothing close to that. I believe Screaming Eagles fans, and fans of football in general, will enjoy Coach Sauk's insight. My sincere thanks go the coach for taking time to talk to us. 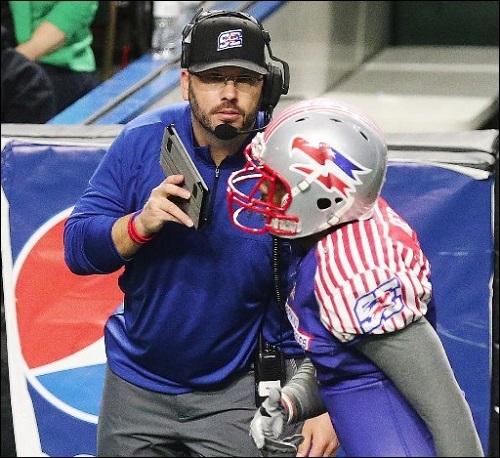 Coach Sauk and the Screaming Eagles will visit the Arizona Rattlers on May 20 at 6 p.m. (pacific). The game can be viewed on Youtube. I like what the coach said about the players and coaches trying to move up to another level and playing for the love of the game. This situation had to be tough for him to come into, but I think he has a great outlook on it. Bannock, this was the best interview you have done. All of your interviews have been great. Your questions varied so broadly. We really got some great input from the coach. I love how much research you do going into an interview. We are all learning about journalism on this site, and this is a tremendous example. i appreciate the way he talked about developing players to play at the next level. that's a really important aspect of the job i would think. great point you made about Dotson still finding a way to make a catch, even on defense. i found it interesting how he said he thought Dotson may better be suited to play defense rather than offense. it takes a quality coach to be able to not only see that, but sell it to the player for the betterment of the team. his comments about loving to coach were tremendous. I've always been a huge admirer of his positive attitude and demeanor. finally, thanks to both Bannock and Coach Sauk for the graduation shout out! Great interview Bannock! Keep up the great work.